KVS Principals, PGTs, TGTs, PRTs, Librarians Recruitment Results 2019: KVS Principals, PGTs, TGTs, PRTs Recruitment Results in January end @ Kendriya Vidyalaya website. The KVS Officials would release the Results of the written examinations for Kendriya Vidyalaya Sangathan Recruitment Examination for the post of graduate teachers (PGTs), trained graduate teachers (TGTs) and primary teachers (PRT) on its official website. The board has also displayed the images of OMR sheets of the candidates who appeared for these exams to recruit PGTs and PRTs, TGTs and TGTs (misc) in December 2018. KVS final results for TGT, PGT and Librarian posts released: The Kendriya Vidyalaya Sangathan has released the final results for the recruitment of the Trained Graduate Teacher (TGT), Postgraduate Teacher (PGT) and Librarian posts. Last year, Kendriya Vidyalaya Sangathan (KVS), New Delhi had invited the applications for the recruitment of Principal, TGT, PGT, Librarian & Other vacancies including PRTs. The written examination for all these posts was conducted on December 22, 2018 and December 23, 2018. The Answer Key for the same was released on January 11, 2019, and objections against the answer key were accepted up to January 14, 2019. The KVS had conducted the personal interviews of the successful candidates in the month of February 2019. Now the KVS has released the final merit list of the selected candidates. The candidates, who had appeared for the interview, can check their names in the list published on the official website. Candidates note that they do not need login or password for checking the list as the KVS has published it in the PDF format. The list can be viewed from the official site or click on the links given below. 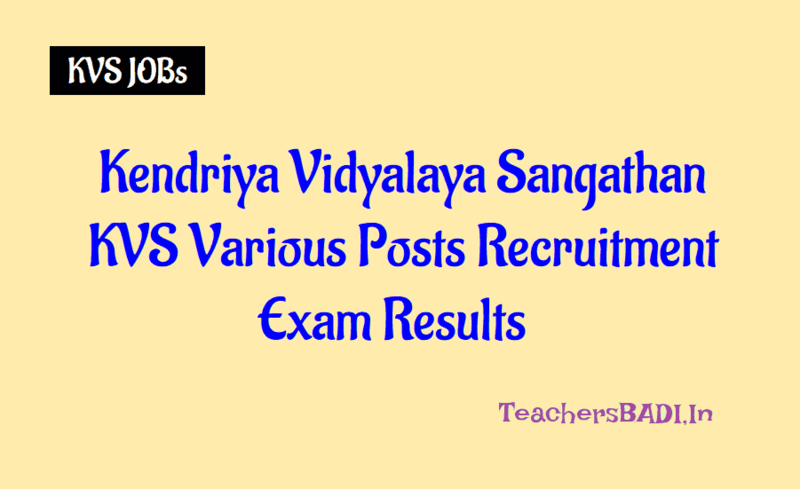 KVS Recruitment Results 2019: Kendriya Vidyalaya recruitment 2018 KVS PGT, TGT Result 2018 to be released soon at kvsangathan.nic.in: Kendriya Vidyalaya Sangathan (KVS) is going to declare the result of recruitment exam conducted for PGTs, TGTs, TGT (Misc. Category) and PRT posts soon. The candidates who have appeared for the KVS PGTs, TGTs, TGT (Misc. Category) and PRT examinations are advised to keep checking the official site of KVS at kvsangathan.nic.in for latest updates on result date and timing. The answer keys for PGTs, TGTs, TGT (Misc. Category) and PRT examinations were released on January 11, 2019. The last date to download the OMR sheet and answer keys was January 14, 2019. The KVS has conducted the examination to fill up PGTs, TGTs, TGT (Misc. Category) and PRT on December 22-23, 2018. The exam was held in three shifts - morning, afternoon and evening. The candidates who will qualify the KVS TGTs, TGT (Misc. Category) and PRT written exam will be called for interview round. The date of interview will be notified later on the official website of the KVS. KVS is conducting this recruitment drive to fill up 8339 vacancies of PRT, PGT, TGT, Librarian, Principal and Vice Principal posts. The KVS recruitment notification for above vacancies was released on August 24, 2018. Selection process: All the candidates will be selected on the basis of recruitment test through offline mode. Further, the registration process for the KVS Recruitment 2018 was held from August 24 till September 13. KVS Teachers Recruitment examination answer key was released on January 11, 2019. All the candidates are advised to check the answer key and challenge the same if any wrong found. The candidates can challenge the answer keys on the official website till January 14, 2019. For any further updates the candidates are advised to check the official website. The KVS had conducted the recruitment examination for the post of PGTs, TGTs, TGT and PRT on December 22, 2018 and December 23, 2018. The OMR sheet and Answer Key download link will be available on the official website of the KVS from January 11, 2019 to January 14, 2019 till 5.00 p.m. The candidates can challenge answer key by submitting their challenges online on the prescribed format from January 11, 2019 to January 14, 2019 till 5.00 P.M.
Category wise cut-off marks of selected candidates for the post of PGTs, TGTs, PRT & PRT (music) has also been released. The final merit list is based on the performance of the candidates in the written test as well as the interview. Note: Please visit the official website of KVS for details and latest updates.